LizzyHouse: baking or candy making! Before I get into the actual post, I want to say thank you with all the sincerity of my truth seeking heart. I know that I've made the right decision and I'm excited to share with you what I am working on. Also, I am grateful for your patience as I send out all of your patterns. And one more thing, before I get to fully commit to printing, I have quite a bit of fabric stuff to finish as all of that is time sensitive with market coming up. Surprises abound! Until fairly recently I was a cake person. You know this much about me. We had cake parties. In school I was baking a different kind of cake almost every week... This has changed. Since the beginning of the year I had almost completely cut out wheat and sugar from my diet. And except greek yogurt (obsessed) I'd cut out all dairy too. I eat vegetables. Mostly vegetables and occasionally fruit. It's really difficult in the summer, especially here, to not eat fruit. Anyway since giving up those things, it's odd, but if I come upon a piece of cake, it is totally gross. It's too dense, way too sweet, and it's like you can taste every ingredient, in a bad way. I'm just not a fan anymore, and that makes me feel bad, like I've betrayed cake. I''ve become the girl who only wants a sliver of cake that your knife isn't sharp enough to cut. yes. There is wheat, dairy, and sugar involved. But it in a really light and controlled way. My pies are not very sweet, in fact, most of the fruit pies I make border savory. Which is champion in my book, and interesting in others. You don't need a lot of pie to be satisfied. And I love the fresh ingredients that essentially remain whole all in a light, layered, flaky, buttery and thin but substantial crust. That was a gross sentence, but when you eat a piece of well made pie where everything remains intact, you give into outplayed descriptive words. Truth. A pie crust is an art. I wrote about it here, and I could write more, but other people who are more qualified have written quite a lot about it, like James Beard Award Winner, James Peterson, and you should listen to him. Add Baking to your cookbook collection as soon as possible. a pie crust is made of essentially 4 types of ingredients. Flour, Fat, flavoring (salt, sugar, citrus peel, herbs, spices, etc. ), and water. Like ink! Pigment, vehicle, binder! On occasion the fat catagory is made up of several different kinds, and then sometimes it can include an egg. I like to keep it as simple as possible. Butter. There are lots of reasons to use a more complex dough. Deborah Madison makes a yeasted pie/galette dough that's a fantastic vegan option that uses olive oil, and James Peterson has a really great sweet dough that uses egg, and is great for tarts, and cream pies. So matching your dough to your pie is a project for a graphic designer who is into baking and info graphics. I will not be that designer today. The garden has been so abundant, and in celebration of my recent decision, I threw myself a little dinner, and didn't tell anyone it was for any reason other than that I felt like having it. So it was a secret I kept for myself, like when you work on a piece of art, or when you are acting a part, or that time I had an important call back and I didn't speak to anyone or tell anyone it was my birthday. You keep secrets as your motivation. So I made a bunch of pies made from almost all things from the garden, except I didn't grow the pie crust. And it made everyone really happy, and that made me happy. My pleased friends were the launch pad I needed. Not because one has anything to do with the other, but maybe as an energetic start. Does that make any sense? Happiness as a buoy. I made four recipes of the standard pate brisee, which gave me about 8 pie crusts. I just knocked them out one after the other in the food processor. When I use a fp, and it's 90 something degrees outside, I cut the butter and freeze it, so it doesn't melt so rapidly. This recipe was featured in the July 2005 issue of Martha Stewart living. I bought it in Rexburg Idaho in July 2005. I have had it ever since, and have always wanted to make this. Its always been in some corner of my mind, waiting for the stars to align with ingredients and ability. I used gruyere instead of fontina, just out of preference. Make sure that you season the tart. It calls for course salt and pepper, but I don't recall it telling you to use them, and you will find that the flavor is intense, but mild, and to your friends or family who are used to stronger flavors (salty) it might just seem bland. Season each layer. You will be happier as a result, and it's just a good practice. I had some time on Friday before I went out, so I caramelized 3 onions. That's a lot of onion. It took a little over an hour to get them where I wanted them. I threw in several sprigs of thyme while they cooked down, and all the little leafies fell off. Then I sauteed some swiss chard, followed by several round zucchinis. When I assembled the galette on Sunday, I rolled out the pie dough and spread a thin layer of the onion (essentially a jam at this point) across the bottom, spread the swiss chard over that, and then beautifully arranged the zucchini in a fashionable and stylish way. I folded up the dough, brushed the sides with cream, and then covered the whole thing with pecorino romano. I baked it a long time, at a high temp, and I let it cool almost as long as I baked it. 375 degrees Fahrenheit for about 45 minutes. I wasn't really keeping track of time though, just color. You want it golden. Before people showed up, I decided that we probably needed an extra savory pie. I had the dough, and I had (have) 50 billion yellow squash starring me in the face, I still had caramelized onions, sliced tomatoes from the t. tart, and I had some feta that had been sitting in water for as long as is healthy for feta to sit in water in your refrigerator. It was a little bit of a stab in the dark, but it seemed like all of these things would work together. The one thing that I was worried about was water content. I thought that it might be too wet, and therefore the crust would be soggy, because I hadn't precooked the tomato or squash. Behold! The caramelized onion was acting as a barrier the whole time, and baking at high temperature, and again, cooling it for an extended period of time let it all come together in a really beautiful way. This either tied for first or was the second favorite. Again, make sure you season each layer. 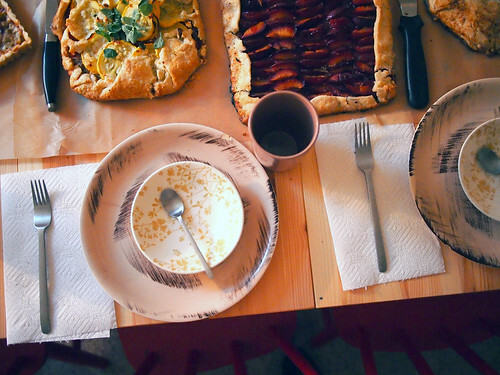 We could come up with a billiondy garden galettes to keep everyone fed and happy all summer/ fall long. This is not an overly sweet pie, so we ate it with dinner. The combination of hazelnuts/sugar/cornstarch make such a fantastic texture/flavor under the plums. These were the tiny plums that I was gifted a couple weeks ago. They kept surprisingly well in the fridge. The recipe calls for plum or red currant jam to glaze the tart after it's finished, but I didn't have either of those, but I did have more plums so I improvised. One of my favorite cookbooks is Breakfast Lunch Tea by Rose Carrarini, and she has a recipe for vanilla apricot compote. I decided to make it just the same, but with plums. I reduced the syrup down to the point of a jam (once the fruit was added back in), and it was hot pink and beautiful. This is a gem of a pie. Pie in the most American of ideals, or at least in my domesticated imaginary visual dictionary is apple, or blueberry. That's text book pie. So it was deemed dessert by everyone at the table, even though I had made no such declaration. The lattice top did all the talking. The recipe comes from Baking, and is a must, and a can do anytime blueberries are in season. cook blueberries, sugar, and lime juice in a pan with a lid for 10 minutes, or until they release their juice. Drain the berries over a large saucepan, and bring the liquid to a boil. When it has reduced to about 2 cups, add the cornstarch mixture and bring back to a boil. It says to let cool... but I usually just add it back to the blueberries at this point. I let the whole thing cool in the freezer while I work on the pie shell. You could use this filling for pretty much anything. I made hand pies with it, and it would be great for turnovers or danishes. I have also eaten spoonfuls of this with yogurt. It's pretty standard, and really great. There were also a few salads, to break through the richness of things. Galettes. They are as stress free as a pie can possibly be. Several reasons: they are more "rustic," they don't require a specific pan, and they appear like you were really going for something, and that usually works out in your favor. Menu planning. Make more savory than sweet. I'm a total sucker for a savory pie. And as a true blue vegetarian, this is a perfect way to feed your carnivorous friends all the vegetables all night long and not have anyone ever peep a grumble, even if they are normally just giving you a hard time. 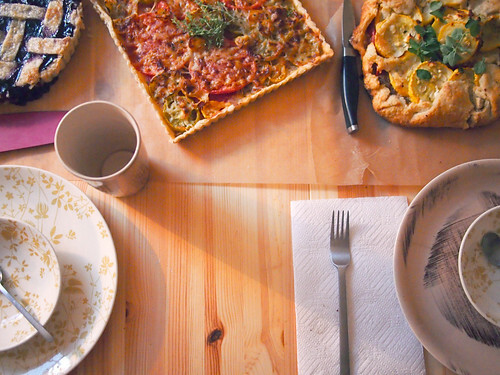 Planning a pie menu lets you optimize your seasonal eating. Include a couple of light salads to cut through the butter, and maybe play a game before you even think about dessert. Maybe you should just play Art Auction. Parchment paper. 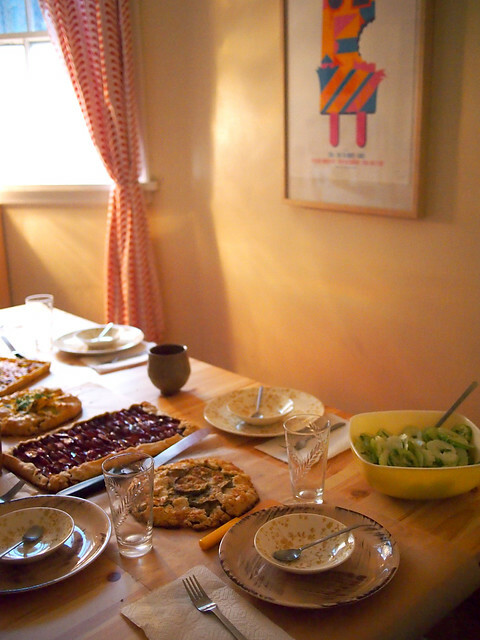 I lined the table with it like a table runner as to not have to put pies on plates, especially because I don't use pie plates, I use tart pans with removable bottoms, and I'd never serve out of those... also I always roll out dough between two sheets. It makes things manageable. Mess wise and pie dough handling wise. Plus you can reuse it several times before it starts to wear. Not true with wax paper, which is totally gross. Serving. 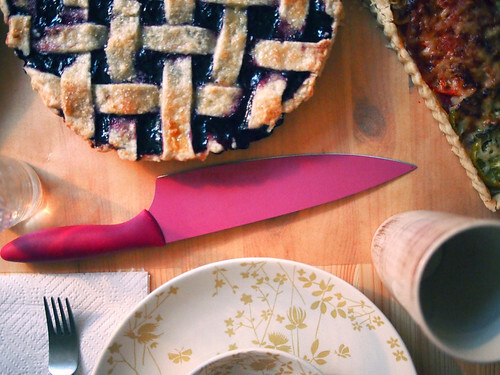 I put out knives and servers around each pie on the table. You were responsible for serving the pie in front of you. That worked out great. When I do this again, I hope that I will have had the foresight to purchase something like these. And hopefully Sabre will have had the foresight to contact me so that we are using my fabric on the inside of them. Like most baked goods your success depends on your patience. A pie is not a thing to ever rush. It's just not going to cooperate, and you aren't going to be happy, and then you will think that you can't really make a pie. You can. You can make a really beautiful pie. A true secret (probably not a secret, just not a practice) to a successful pie crust, is putting your finished pie, before you bake it, back in a cooling device for at least 30 minutes before you bake it. It will allow your pie crust a fighting chance at not falling apart, being flaky (butter should melt in the baking process, not before), <---- and not being transparent when you do bake it (a symptom of melted fat). Also, and I can't stress this enough... let your pie cool. Resist, step away, leave the house, do whatever you have to do, but let your pie completely cool before you start picking at it or cutting into it. It needs to cool to be its best, and to come back together. It's chemistry. You'll be so glad that you did. The whole pie cooling in a window thing, is really a thing. The night was a success, and I think you should probably also have a pie dinner 2012. I could see making it a tradition if for nothing more than it's special, and delicious. But I like the idea of doing extra nice things to quietly celebrate a moment for yourself. Hi peepers. I've been working on a slew of new products for all your summer treat making! These products have come from a love of making beautiful things as well as threatening jeers for the past 5 or 6 years that have been aimed at me with the sole intent of getting me to produce recipe cards. Well it finally worked. You've shouted long enough. Tonight at midnight all of the new stuff will go live in my little shop. I've been giving you glimpses on instagram and twitter, and so some of you have inklings of what I've been up to. But I will have you know that there is one item that is limited. The summer treat set is in an edition of 50. It includes 10 recipe cards (5 of each design), 10 hang tags, 10 canning labels (only available in the treat set), and 3 yards of the prettiest blue bakers twine you've ever seen. All of these designs come from Hello Pilgrim which I can't seem to get over. So I won't, I'll just keep loving it. And if this treat set goes over well, then there might be a few more up my sleeve. Radish edition anyone? So! See you tonight or tomorrow! I've been doing a lot of baking. It keeps my house warm, and I am making food, AND baking/cooking for me is a really good creative outlet to give me a boost. Also, I like having food ready for people when they come over. Or making food for people to come over.... It's just all around good. This past weekend, I made little curried vegetable hand pies. I've been working especially hard on perfecting my pie crust. It seems like a good place to start in perfecting any sort of baking. I've read a lot about what makes a truly good pie crust, and the grand sum of it is temperature. It just has to be cold. In Baking by James Peterson, he says that a dough can even be over worked and still turn out alright just as long as the fat (butter, shortening etc...) stays cold. This has become especially easy for me as the temperature has dropped dramatically, and I don't keep my heater on when the sun is out. So when I break the butter into the flour with my hands, my body temperature doesn't melt the butter. Also, I keep a dispenser of water in my refrigerator, so the water stays icy cold. I actually just put the bowl under the spout and have gotten to a point where I know what 3 tablespoons looks like. Peterson also goes on to talk about most types of pie crust looking like a "shaggy mess", and only require enough liquid to be able to roll out your dough. He states that all brands of flour absorb differently so it's just something that you just get a feel for. I could go on and on about what he said. The man is a genius and an expert, and the book is an incredible tool, as well as a good read. anyway. These have been my breakfast and lunch for the past couple of days, and I've been serving them/ eating them with Greek yogurt. It goes so well with the spices I used with the vegetables. They are filling and warm, and just the right thing for weather like this. And terrificly enough, they freeze really well! I made the cake for the wedding reception that I went to this past weekend. When I got to the Jimison's house, I knew that there would not be room in the refrigerator for the wedding cake, so I thought quickly and texted a friend whose parents live in town to see if I could keep the cake in their fridge. Yes! Within the next hour the cake was safely stowed in Griffin's fridge thanks to Ben and his dream Mom, Marilyn. This was the day before the event, so my plan was to come back a few hours before the party and assemble and finish the cake. No big deal. I woke up early at the Jimison's and made an extra batch of buttercream just to be on the safe side of things. I didn't want any single thing to possibly hold up the cake going together, drama free. I dyed the frosting a perfect shade of green to match the envelopes to the invites. It was great. Everything was great. I am a Swiss Buttercream pro. I start pushing around the slc buttercream, just to see if it's thawed enough to repair a little travel damage on the cakes before I decorate them with the Rexburg buttercream.... It started to break into chunks, and seperate. Ok... Rexburg buttercream. I decided to put in the pastry bag, and warm it up a little with my hands to start working on the cake... now this one starts to separate. But since it's dyed green, it starts to look like something out of a science fiction movie as I am watching it curdle and separate while green liquid rises in the bowl. WHAT IS HAPPENING. I have never had a buttercream separate before. EVER. And this reception starts in 2 hours, and I have to get this thing decorated. The crumb coat isn't going to cut it. Marylin got home to me fanatic and horrified. "I don't understand what's happening," I told her. "This has never happened to me before". I start trying to figure out what it could be, but then I just decide that it isn't important. I will just make more buttercream, and get on with it. We gather up the ingredients and tools, and I start making another batch. I get all the way to the stage where you add the butter, and I am watching it start to resemble the others. I'm sweating, I'm panicking, and then I prayed. WHAT DO I DO? THIS HAS TO WORK! Calmly and quietly, this was the answer I got. stop. put the bowl in the fridge. turn out the lights. I did all of those things. I turned off the beaters, I stuck the bowl in the frige, and I turned off every light in the kitchen. It then dawned on me that there was a low spot light directly over me, and all of my broken buttercream. I thanked HF, and took a minute to clean things up and collect myself. Marilyn came back into the kitchen and asked why all the lights were off, and I told her that I realized that they were the cause of the curdled frosting. She then told me that the counter felt cold, but she put things on it to thaw... hence the floating green liquid, ie. melted butter. It was getting zapped from both sides. I waited about 15 minutes and pulled the buttercream out of the fridge, beat it as smooth as it would get for being nearly dead, frosted the cake, decorated the cake, and then worked with Marylin like we were on a Food Network Challenge to get the cake back to the Jimison's. It amazing how having a two foot cake in your lap on a 10 inch cake stand will point out every bump, crack, and pebble in the road. It was finished. It was where it was supposed to be. It looked pretty good, all things considering, but above all, it tasted really good, and I was able to make a very sweet cake topper because of the one that Andrea had made a week earlier in Toronto. It worked perfectly. Thank you Andrea for the brilliant idea!!! so thanks to everyone who helped make the cake happen. Ashlee for ingredient shopping with me, James and Annie for cake transporting, Ben for helping find a home for the cake, Marylin for letting me use your kitchen, giving me ingredients for that last buttercream, and letting me use your beautiful cake stand, and Andrea for inventing such a wonderful cake topper! so will there be more wedding cake making in my future? I hope not. But probably. This is the only picture I have seen so far, if any others get posted I will add them. have you seen National Velvet? Starring a young Elizabeth Taylor? Well, her little brother, in the film, at the table for breakfast says, "I was sick all night!" boy: I WAS! I was sick all night! but he says it more like "sickall! night!" that has been a long running line in our family, if you are sick than you say that. well, I've been really sick for a little bit now, and I feel like for me that equals short term memory loss, no appetite, 18 hours of sleep a day that's still not enough, as well as a really hard time getting anything done. Plus it's hard to be sick when you are on your own. It's like everything explodes. I picked up a whole grain pizza dough from Whole Foods (it's awesome!) and topped it with a smidge of fresh mozzarella, a roma tomato, 2 fresh eggs, and little specks of butter. I don't think that dairy is necessarily the best choice right now since I am so congested, but when I am sick, I feel allergic to nuts... where is normally where I would get my calories. I added a few mushrooms before I baked it, and then I let It do It's thing. I didn't want the yolks to cook, but I was on the phone and I let it go a minute longer than I would have liked. Still good. Before I ate it, I covered the whole thing in pea sprouts. Sprouts of the gods. If you are in SLC the South East Asian market carries them. Just a few bites really did it for me, and with a cup of blood orange tea, I am ready to sleep away the afternoon... as soon as I get a little laundry done. It's a shame that things still move around you, even when you are brought to a halt. Also, are any of my Canadian peeps into the show Being Erica? I've been obsessed with it for the past week. I just finished the 3rd season and I really hope it gets picked up for a 4th. It's currently on Hulu, and I love Dr. Tom. I wish I could do time travel therapy. so for all of you sickies, feel better soon. And for all of you caring for sickies, bless you. I know that a lot of you have been very worried. Worried about whether or not there was going to be a cake party. Well you can rest easy from here on out. Because there is one. SO for all of you market goers and friends come to my Semi Annual Cake party. This years cake is sure to impress all of your senses. Including your sense of humor. Who? Any one attending Fall Market who wants to sit down and eat a piece of cake with this one [pointing to myself]. Also, as cake party grows, so does the cost. If you are a loyal cake party fan or are just looking forward to this treat then feel free to donate a couple of dollars to the cake pan. Thanks so much everyone! I can't wait to see you all at Market! ps. I am still doing an Eats guide. It just is taking a while. Obviously. So I think me and everyone else involved is on their "pre-market slim down". So there is no candy. There is no cake. There are no sweets. There is no joy. But I have to tell you that working with Castle Peeps is like eating candy all day long with all of the benefits and none of the side effects!!! I think that most candy is probably more visually satisfying than it is actually satiating. Never do you eat a gummy lifesavor or Midnight Milky Way and feel satisfied. NO. You need more. But yuck. After you eat 2x your cats weight in Reeses Pieces you want to die! It makes me feel like candy might not actually be meant for human consumption. I think for the most part, candy is linked to nostalgic memories of summer, class parties, holidays, and things like that. I actually find now that most candy for me is strictly emotional. We did some serious damage at Target for Easter just because of the memories/happiness it evoked. Knowing better, we shipped everything off to siblings and friends in need of Easter cheer. Candy case in point: I buy a bag of circus peanuts because I remember how happy/silly they seem to me... I do not buy a bag of circus peanuts because they taste like inflated banana styrofoam. So honestly. Castle Peeps fills that need for inverted sugar and colorful memories, without ever having to feel nauseous. Here is a pic of Finn cooperating with me. Castle Peeps would go well with children, but all I've got is Finn. also, if you know that you are going to need it/ love it/ use it/ hoard it, go ahead and join the Castle Peeps Flickr Group! I do love a bit of cake! It's almost market time!!! That means a number of things. New Fabric. Freak of nature late night sewing. Bad eating/sleeping habits... and anticipation. It's like a semi annual family reunion. But this Market is Especially SPECIAL, because my dear sweet Mother's book is entering into the world. SO, in honor of that, and our new found cakely tradition... we are throwing our second semi annual cake party. We will be holding our very own launch for City Quilts. Unfortunately, I will not have a kitchen to bake in, in Minneapolis, so we will be ordering the cake. But hear you me, come Houston, the cake will be mine once more. So forget your diets and come cake with us! Noon on Saturday at some mystery location in the convention center, so it's convenient and we can all get back to work (or schmoozing). Anyone who is attending Spring Quilt Market in Minneapolis, Minnesota and loves the House family is welcome to come! like I said, my Thanksgiving job was a vegetable, and a dessert. So, when it came time to decide on a dessert, I went to an old standard. It's my sisters favorite thing that I make; they always ask for it whenever we are in town together, and they would request me to bring it to dinner parties to dazzle our friends. Well it is a dazzler. It's my Champion Chocolate Orange Cheesecake! If you enjoy the chocolate orange combination, then this is cheesecake for you. A quick note before I give you the recipe. Make this the day before you have to go somewhere. It takes about five hours in the fridge after baking for an hour, and sitting out for half an hour. You don't want to rush any of this. Using the bottom of a 9 inch spring form pan as a template, trace the circle onto a piece of parchment paper, and cut it out. I fit strips of parchment paper around the sides of the pan that extend past the top of the pan, for none stick protection, and! your cheescake will rise, and this will protect it! Place circle in the bottom of the pan and close it. In a small mixing bowl combine chocolate crumbs with melted butter. Once fully incorporated, put half of the mixture into the bottom of the prepared pan. With the bottom of a measuring cup, press the crumbs flat on the bottom of the pan. Add more if you need it to cover the bottom, and save the rest. Don't press the crumbs on the sides. In a large mixing bowl beat cream cheese and sugar until fully combined. Add vanilla, mix again until fully incorporated (beat about two minutes). Now add the sour cream a little at a time, until completely blended. Then add each egg one at a time, making sure each one is mixed in before adding the next. Scrape down the sides of the bowl to make sure you haven't missed any rogue bits of cream cheese. Once everything is combined, add zest of 3 oranges, and beat for about 3 minutes. In a microwave safe bowl, microwave chocolate for 2 minutes. When it comes out, it might appear that it isn't all melted. Do not stick it back in the microwave. Just stir it up, and they will quickly all melt. Add remaining zest to the chocolate. Let it sit for a couple of minutes so that it can cool down. Add about a 1/4 of a cup of the cheesecake mixture to the chocolate. Stir quickly. This is to tempur the chocolate and the cheesecake, making their temperatures more even, so your eggs won't curdle. Add another 2 cups of cheesecake to the chocolate, stir until combined. This is the part where you get to choose. Do you make the whole cheesecake chocolate? or do you marble it? If you want the whole thing chocolate, then pour the chocolate mixture into the large mixing bowl with everything else and beat until combined. If you don't, however, then keep them separate and marble them before baking. preheat your oven to 325 degrees Fahrenheit. Put down 3 or 4 dollops of the chocolate mixture into the bottom of the spring form pan. Then pour some of the plain mixture over it. With a skewer, pull gently through the mixture for desired appearance. Repeat this process until the pan is 3/4 full. I usually put some foil around the bottom of the pan, just to protect it, in case it should leak. put it in the oven, and bake for 45 -80 minutes depending on your altitude. After 45 minutes, check on it every 15 minutes. The top will be golden brown, and when you move the pan, most of the jiggle should be gone and the center set. When it is down, pull it out and leave it alone! It will have risen mightily and will proceed to deflate. Just let it do its thing. After 30 minutes to an hour. You can carefully remove the outer ring, keeping the paper intact. Place in the fridge, for at least 5 hours or over night. Dazzle and charm your friends! are you ready? Are you ready for my market review? Here is what I did get a picture of. Elizabeth and Pam drove all the way from California, and were woeful because they hadn't seen an armadillo, so I (with some inspiration from my Mom) decided to make them an armadillo. A red velvet armadillo. It was my first time working with fondant. It's weird! But I could see myself using it again. It was very red, and a little startling. I don't eat meat, but I do eat cake.